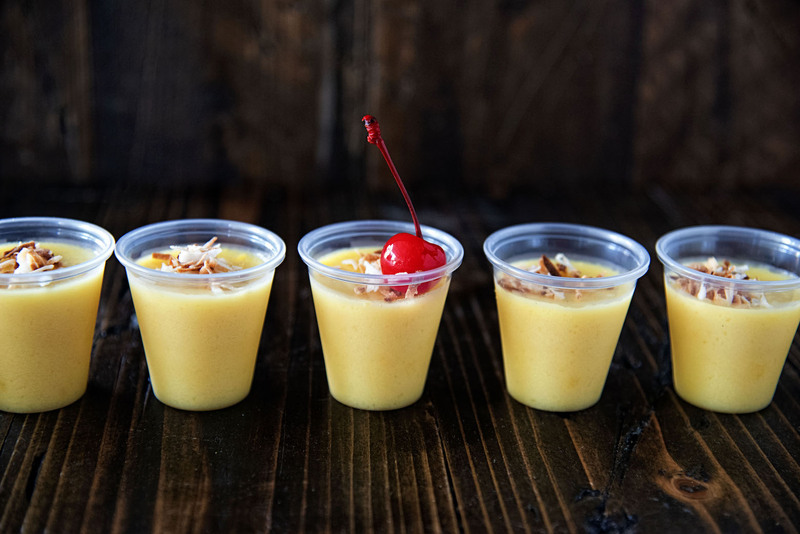 Pineapple Coconut Cream Jell-O Shot: Pineapple-Coconut juice, pineapple Jell-O, coconut cream pie pudding, Malibu Rum, and Rumchata make up this tropical Jell-O shot treat. This week’s Tipsy Tuesday Jell-O shot has an island theme. Even though I am fully in fall minded mode, this Jell-O shot is the favorite of many of the guys on the hockey team and therefore the recipe gets asked for a lot. It was our last game of the summer season last night and so I decided to make their favorite. I could have called this a Pina colada shot but it’s slightly different. For one it has coconut cream pudding in it. Because of that this Jell-O shot is a little more sturdy than your average shot. The pudding also has coconut in it so don’t worry that you see little chunks (that’s coconut). It also contains Rumchata. Because it contains dairy when you add it to the pineapple juice it will curdle…but once you whisk it all together it’s fine. So don’t panic. 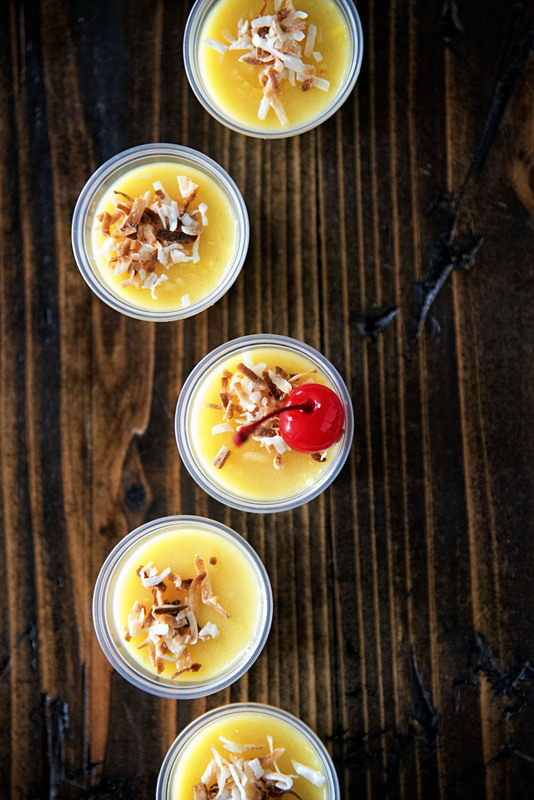 This recipe uses Island Pineapple Jell-O. You can find it at the store from time to time but I just buy 4 boxes at a time from Amazon. Pineapple-coconut juice is used in this recipe but if you cannot find it then you can use just regular pineapple juice. 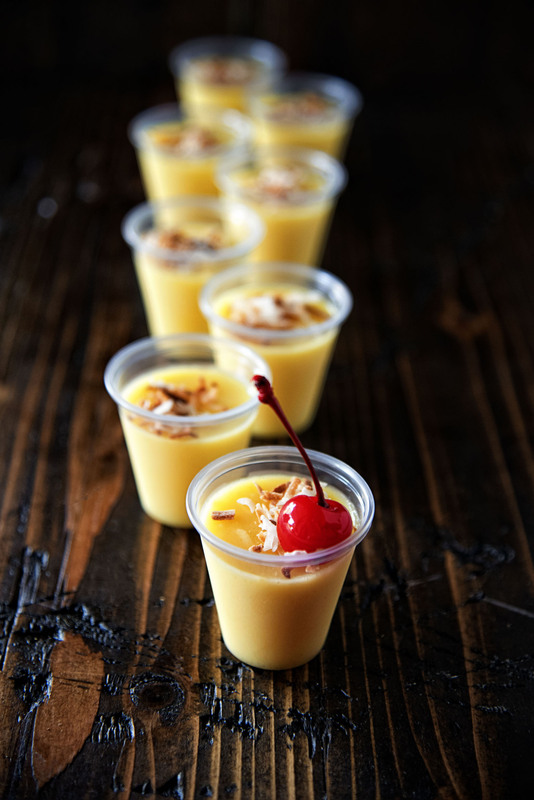 So the next you are invited to a luau or just want to bring a little sunshine to your party make these. Bring the pineapple coconut juice to a boil. Empty jello powder into a large mixing bowl and add the boiling pineapple coconut juice. Whisk in the coconut cream pie pudding powder and mix until dissolved. The pudding has little pieces of coconut in it…that is normal. Add in the 1/2 cup of cold water, 1/2 cup of Rumchata, and 1 cup Malibu Rum. Top with toasted coconut for garnish if desired. I love everything pineapple coconut and can’t wait for a reason to make these! These are amazing! We made them this weekend and loved them, I think they are our favorite! Thanks for the great recipe!